I know of you Dragoondaniel! welcome to the forum and good job!! Oh very nice job Dragoondaniel!! And to the Forum--we are delighted you are here! That's a great match! We are looking forward to actually seeing the show--one way or another--and will appreciate any other insights you have! Heee...no more lurking allowed now! Thanks Daniel! That places it right next to the Cavenagh bridge, where the cameraman was, and only a few blocks away from Suntec City (the first task, probably). I am dying here waiting to be able to see the whole thing! Big ! Fly to Manila, Philippines and make their way to the Detour. Detour: Egg Eating or ? Paula & Natasha are banging something. Maybe another singing and beating the drums task. Pitstop: ? NEL or EL? 10. Monica & Edwin (Hong Kong) ? Ahhhh, I really hope that Ann/Diane survive! As I've read, Kinar(and Brett) of Team Indonesia metioned in an news article that she was in the shooting for 24 days, which is excatly how long the race lasted. So, they probably lasted quite a while and possibly in the final 3. They had a translation back then but im not sure where its gone to, but im pretty sure she metioned about being in shooting for 24 days. "And this new race will see teams cover over 50,000km across 4 continents in just 24 days, as compared to 36,000km in 2 continents last season." jonnal! Glad you have joined in the fun and thanks so much for pointing that out! They seem like a great team to root for so wonderful if they do end up in the final three! Keep us posted if you see more--thanks again! The couple's participation started from their hobby watched the agenda reeking of the adventure and the tour. "We always commented, definitely OK really, was paid to travel around the world," said the woman born in this March 3 1979. "Three weeks shooting stressfull, but fun." That most had difficulty, to the bathroom must mikir 1,000 times because that was other could nyusul. I must keep urine and drank until wanted unconscious, he said, on Tuesday (2/10) in Jakarta. Apart from physical preparations, they tried to maintain the solidarity. "He yelled, we did not know the further route and the challenge that were dealt with," said this Sudden Dangdut film player. For the sake of the practicability, he only carried three socks, two long trousers, and some underwear. The finalist the Femina Face 1997 deliberate brought thin clothes so that fast dry after being washed. The other hindrance that was dealt with by Kinar was painful knees as a result of being tired. The "profit had Brett that mijit my knees," he said spoilt. Thanks for the articles, jonnal. And welcome. Hehe, no problem and thanks everyone! I would root for them too and of course Team Singapore. Oh anyway, so it was three weeks not 24 days as stated in the article, hmm mabye I was reading something else that time, but they probably did made it far and late into the race. And it seems strange that Kinar has came out with another article in the same newspaper and she confirmed teams went from Singapore to the Phillipines in the 1st leg and were asked to eat a balut...probably a roadblock? I mean...Is she allowed to say these things even before the race has even begun? Haha...mabye all these things is to put us off? jonnal, the difference between 3 weeks and 24 days has a potential explanation. Racers tend to count the pre-race lockdown as part of their racing time because from their point of view it is. This typically takes about 3 days. However, producers typically do not count it in their statements about the length of a race. But it is still strange that the contestants are allowed to give out "gifts" before the race started. Episode 1 "SNEAK PEAK" Almost a recap!! In “The Amazing Race Asia” Season 2 pilot tomorrow night, host Allan Wu assembles all the 10 teams by the Singapore River for the adventure of a lifetime. They are shown the highs of Singapore when they are brought to one of the Republic’s famous hills and then to the top of the nation’s wealthiest buildings. This is good news for the Singapore team composed of gym buddies Collin and Adrian. However, conflict ensues early on when the Singaporeans do something that makes Rovilson say, “Those guys are monsters. Just because he has a hearing impairment means nothing!”For the teams’ first task, they have to scramble for taxis―a special one assigned for each team―which makes hailing a cab in Singapore extra difficult, especially for two teams who get stuck searching for their cabs while the others zip to the next location. Next, the teams are thrown a curveball and made to choose between climbing up and down 45 stories of stairs or crossing over one tall building to another, dangling 181 meters off the ground. In a race where every second counts, picking the crossover challenge is the better time-saving idea, and it expectedly induces some panic attacks from some contestants. After a detour, the teams leave Singapore and travel over 2,000 kilometers across the seas to the next destination: a city in the Philippines. The two Philippine teams are naturally ecstatic; one even breaks out into a dance! At the next city, teams have the luxury of digging into one of the nation’s most infamous delicacies: the balut. While several racers are famished enough to eat anything, not too many of the racers are able to consume the balut, after being told what it is. One takes a bite but spits it all out, while another courageously finishes it but regurgitates it before long. And then there’s the mad race to the pitstop, which is always thrilling to watch. Witness how one team gets out of their vehicle to push it when the slope turns out too steep, while the others decide to ditch their rides and just rely on their feet. Find out what it takes to finish first: lightning speed, great strength or a combination of good looks and a little brain power. 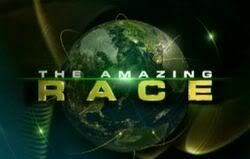 Catch “The Amazing Race” Asia 2 on AXN tomorrow at 9 p.m. Sounds interesting. I hope I can get access to this as the normal "satellite coordinates" are currently down. Pam and Van 1st place is quite a surprise really... but will being in 1st place in the 1st leg curse strike again? Thought I saw this one in the opening sequence! Oh what fun! Thanks banzai! OH THANK YOU Banzai! I am dying here waiting to see it! Wonder what does this mean? Peach, it means the same that it did for Amazing Race Asia 1 - nothing special. Several of the cities on the half-globe are ones where actual racing is taking place in ARA2, such as Tokyo, Auckland as the airport to get to/from Rotorua and probably Bangkok as the airport to get to the Finish Line. But with all the European locations, I do not see ARA2 getting to Los Angeles, Sydney again, Jakarta, or Istanbul. You know that you can't take the screencaps for any Amazing Race TV show too seriously.